Fukushima may in fact have been caused by an act of war under the cover of an environmental disaster. NHK released a bogus report – NHK PULLED IT, PROBABLY IN RESPONSE TO THIS SITE !!! 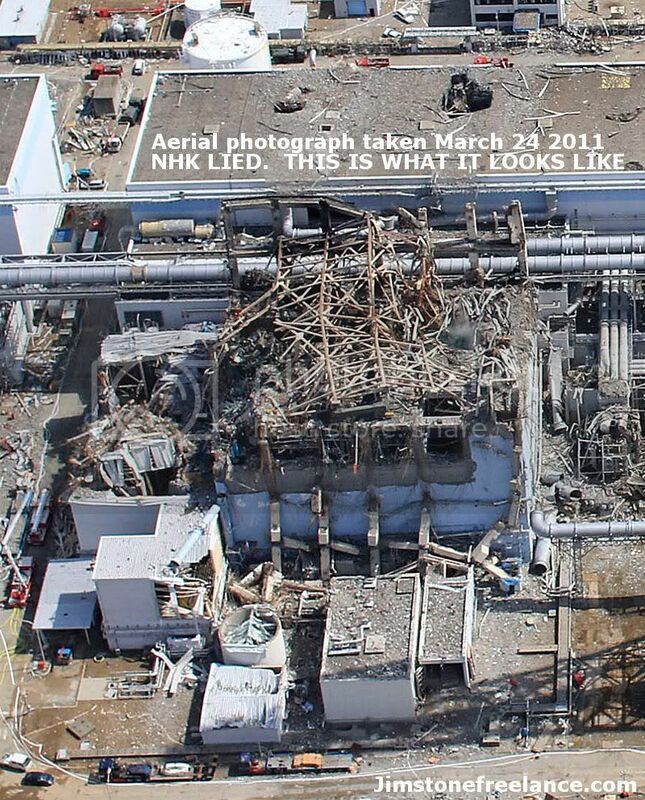 On Feb 26 2012, claiming they have the first aerial footage of Fukushima when far better aerial footage has been posted on this site since May of 2011! Furthermore, NHK modified their photos! What are they hiding? Well, what is reported here, of course! I permit and encourage entire site mirrors of all my articles. Copy them and run them as your own; my topics are huge and often need distributed protection. It took them three hundred years and trillions of dollars to build a theatre of darkness, yet the light of only one match can burn it down. Do not let this light go out. Archive and POST! This is a massive report. If you have troubles understanding it, just look at THIS picture of the vanished reactor, THIS picture of the destroyed facility and THIS picture, of Magna BSP’s camera. Then scroll down to the photos of the NON EXISTENT quake damage and seismic charts which prove there was no 9.0 and therefore the very real tsunami could not have been natural. The fact that what happened in Japan did not occur naturally has been very well documented by a skilled investigator, who spent hundreds of hours getting to the bottom of this story. This report uses classified leaked high resolution photos of the destruction of Fukushima, schematic diagrams of the reactor systems at Fukushima, and the original seismic records to support it’s claims. 2. Reactor 4 is Building 7, demolished by explosives. Reactor 4 had been defueled and was undergoing replacement of it’s internal stainless steel shroud, yet blew it’s containment anyway. That is the FINAL smoking gun, an empty reactor is inert, and cannot produce an explosion, yet one happened at 4 that was so powerful it destroyed the structure leaving it in danger of falling over. because in an open fuel pool the water boils off at 100 Celsius, and won’t be present in pressurized form at 2,000 degrees Celsius to liberate it’s hydrogen by losing it’s oxygen to the zircon cladding in the fuel rods. The rods will prefer the free oxygen in the air and burn long before attempting to claim the oxygen in whatever humidity there might be. “The most qualified nuclear engineer in the world” Arnie Gundersen has spoken of. I got to the bottom of the Arnie Gunderson story, and added the results of that investigation further down the page. He has been put on a pedastal and pumped up enormously by a press that wants a misleading story, all the while he is a despised outcast of the greater engineering community. and as a result the disaster at Fukushima is FAR FAR WORSE than ANYTHING Gundersen is willing to say. Gundersen is towing the line and hiding the true magnitude of what happened there because if it became widely known serious questions would be asked. When have you heard Gundersen talk about a totally missing reactor? 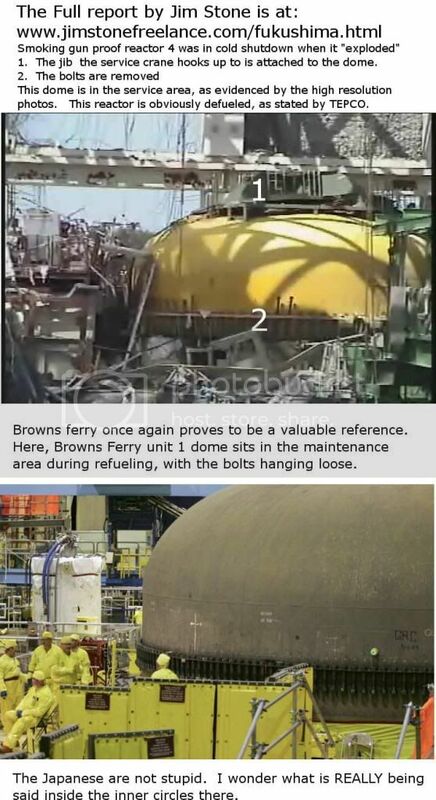 Reactor 4’s dome was removed for defueling. 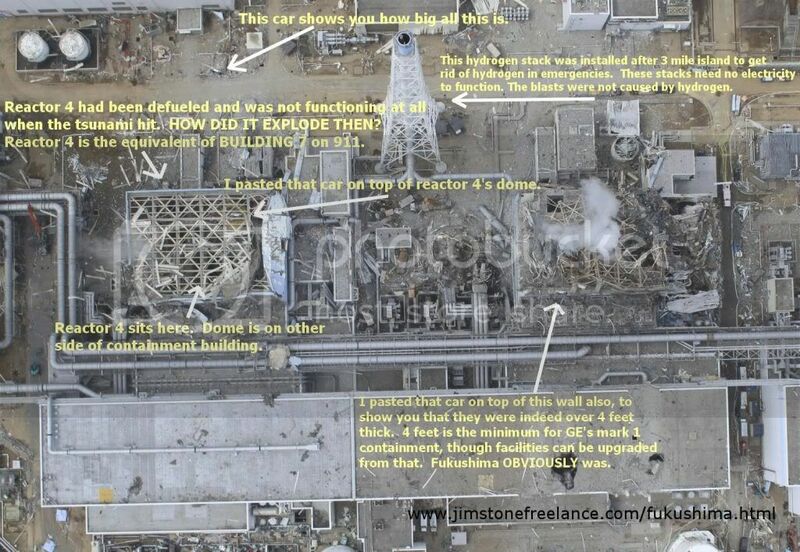 Drone photos prove it.This dispels the rumors surrounding unit 4’s explosion. Some people have said that this reactor was secretly in operation to enrich plutonium. This photo proves it was disassembled for shroud replacement as stated. 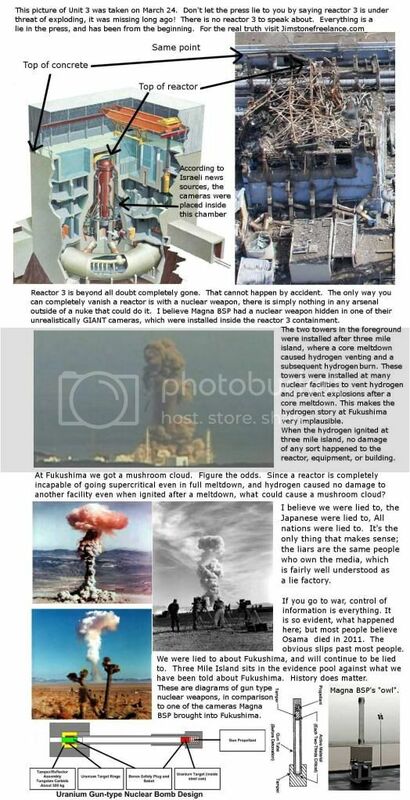 Tepco is going out of it’s way trying to explain the explosions, especially at reactor 4, because they did indeed occur, so an explanation is needed. As a result, they are giving reasons that cannot happen, just to say something. They need to see this post and get the Arava perspective(Arava is a district surrounding Dimona). That the destruction of the facility is so severe it could only have been accomplished with nuclear weapons. Hydrogen produces a non-ideal subsonic explosion. It cannot turn concrete into dust. It can produce high pressures if sealed off, but the metal roof on all the reactor containments should have provided the relief and been the only thing destroyed. It takes a high intensity explosive to strip concrete off rebar, a blast wave many times faster than supersonic. 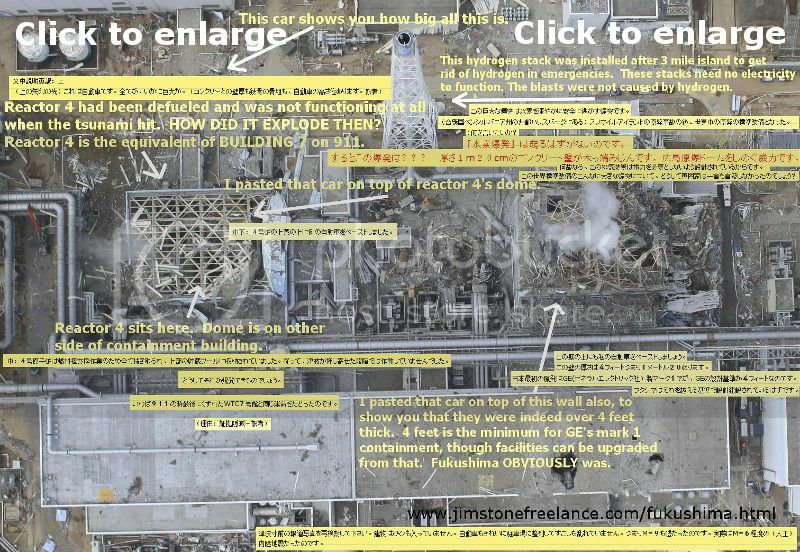 This means that whatever happened at Fukushima did not have blast characteristics that fit the “official” story. If you missed it in the high resolution photo of the destroyed facility, I took a car that was laying around in the remains and placed it on top of one of the blown away walls at reactor 3, which clearly gives the reference that the walls had support columns at least 15 feet thick. It is true that gas explosions can be very destructive, but only in facilities that were not designed to handle them. Even the basic mark 1 containment was many times beyond capable of withstanding the worst hydrogen blast. Their “security cameras” weighed over 1,000 pounds and were the size and shape of gun type nuclear weapons. The reason Magna BSP gave for the odd shape, enormous weight, and giant proportions of their cameras was that they were stereoscopic. They have creatively called them bi-scopic so when you search on google their monstrous cameras are the only thing that comes up (outside of Dj lighting and a gun scope) Try it. Type “Biscopic camera” into google images,(without the quotes) it’s a hoot! This helps marketing I guess. The need for such a large stereoscopic camera could be plausible at an airstrip, where the camera would need depth perception out miles, but not indoors where focal lengths are short. Other manufacturers have units appropriate for indoor focal lengths which are only twice the size of ordinary monocular security cameras. Magna does make passive radar systems which require a large body, but the owl could accomplish it’s claimed function with two small lightweight cameras (5 or so lbs, not tiny) and the processor in a modern laptop. Why this giant thing? note – a not yet produced graphical model is what you see most on Google, the ones produced thus far are ugly boxes.
. . . . . . . 9/11, 4/11, 3/11? see a pattern? Let’s not see a 6/11. Your time and effort in spreading the word may really make a difference.